Ten thousand miles from the drilling shacks that dot Northern Ontario and Quebec is a culture that loves Gold, the people who are associated with this culture are from India. In fact India’s love affair with precious metals extends to silver and diamonds. Depending on who you ask India is either the number one or two importer of Gold in the world. Gold has a rich tradition in India, which dates back 4000 years. In ancient Hindu events like Ramayana and the Mahabharata, gold is tied to Godliness and Kingliness, as a direct result of this sentiment 11% of the gold reserves worth over 800 Billion is entrusted into the hands of Indian housewives. Helping the Indian people, consume gold is the Amrapali Group headquartered in, Ahmedabad, India. Amrapali Group imports Gold dore and refines the gold to 99.99% pure. In 2017 Amrapali imported .6 million ounces of gold dore and 37 million ounces of silver. 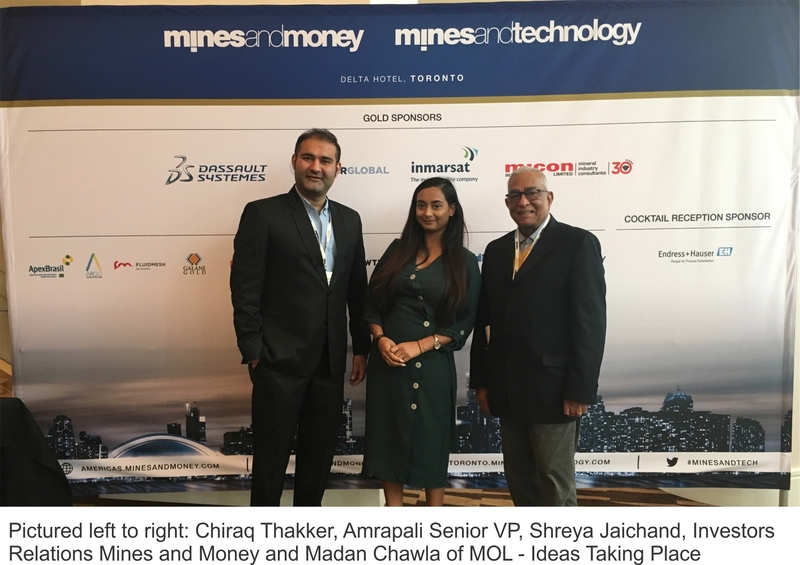 Recently Chiraq Thakker the Amrapali companies senior VP was personally invited by Madan Chawla of MOL- Ideas Taking Shape to attend Mines and Money in Toronto and met with a Canadian Trade-Ex representative. At the Mines and Money events, companies introduce their projects to institutional investors, bankers, brokers and investors from North America, Latin America and around the world. From asset managers and private equity players to debt finance providers and private investors. For investors, Mines and Money is considered one of the best venues to find new investment opportunities. Attendees get to speak to senior executives from over 100 pre-qualified junior mining projects and hear asset allocation strategies and analysis from the world’s leading investors. Thakker attended Mines and Money seeking to buy bullion that will feed the gold appetite of his Country. The challenge in securing Gold dore for Amrapali is the competition. Companies with proven and probable reserve estimates and reputable management teams find it easy to attract investment where contracts are focused on net smelter royalties (NSRs) as well as forward-selling contracts. Thakker believes that if Amrapili is going to be successful he will need to reach out to the mining community at a different stage of their life cycle. Growing a business amongst 1.25 billion people you need to be resourceful and Thakker told MOL and Canadian Trade-Ex “we are willing to explore all options, including establishing relationships with Juniors, including reviewing the feasibility of a toll smelter in logical areas.” Our goal is to secure millions of ounces of gold and silver. The Amrapali Group will bring resources to the table that is needed to ensure a sustainable supply. He says he’s hoping to attend the world-famous PDAC Prospectors and Developers conference in Toronto this spring and perhaps follow that up with property tours during the Canadian Mining Expo in the heart of Gold Country (Timmins, Ontario ) at the beginning of June. To help facilitate the vetting process Amrapali has commissioned Madan Chawla of MOL and Canadian Trade-Ex to compile a list of best gold and silver properties. In the coming weeks Thakker is hoping to fill his PDAC appointment book with promising opportunities. Please call 705.264.2251 and ask for Glenn or Rory Dredhart.